Looking to improve your diet? 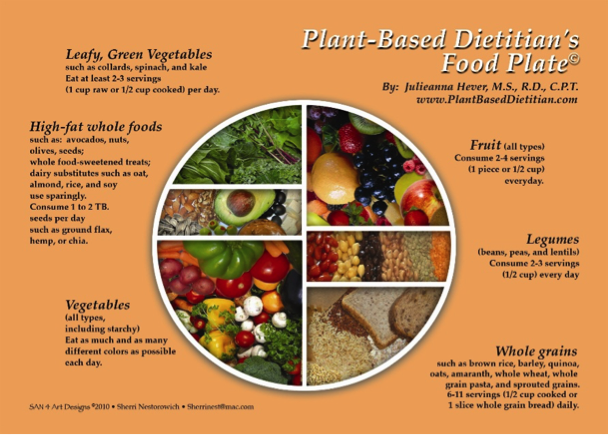 Adopting a plant-based diet can be an excellent way to increase health through the foods you eat. Benefits of adding more plant foods to your diet include lower risk of cancer and chronic diseases, such as diabetes and heart disease. Most recently research has shown you’ll live longer too. In a 2013, a study in the Journal of the American Medical Association, vegetarians lived between four and seven years longer than non-vegetarians. Researchers attribute this to a higher fiber intake and lower saturated fat intake by focusing on more plant based foods and heart healthy unsaturated plant fats. Lacto-ovo vegetarian: No meat, poultry, seafood, or meat products (such as gelatin, broths, gravy and lard). These vegetarians will still eat eggs and dairy products. Lacto-vegetarian: No meat (as above) plus no eggs or products containing eggs (such as many baked goods). These vegetarians still consume dairy foods. Vegan: No meats or eggs plus no milk, dairy foods (such as cheese, yogurt and ice cream), ingredients made from milk (such as whey and casein) or honey. Vegans in particular tend to have lower BMIs, have lower cholesterol and blood pressure and subsequent a reduced risk of heart disease. Pescatarian: the only meat eaten is fish; they still consume eggs and dairy. Beegan: vegan, with honey included in diet. Flexitarian: eat mostly plant foods, but include small amounts of meat in the diet. Vegan before 6pm: follow a vegan diet until 6pm daily. Will I get enough protein? Absolutely! But you need to eat legumes (beans, peanuts, peas, lentils) and/or nuts routinely. Protein is also found in most vegetables (especially deep green leafy vegetables) and whole grains. Heads up: you only need 10-20% of our calories from protein unless you are an endurance athlete or weight lifter. Can I get a vitamin deficiency? Yes, if you eat a lot of junk foods that are highly processed and low in nutrient value. But even meat-eaters who eat too much of these foods have deficiencies! How do I get started? Check out some of these websites or go to your local /online bookstore for a vegan or vegetarian cookbook. If you are considering adding more vegetarian/vegan foods into your diet, but aren’t sure you want to completely remove animal foods – try taking a flexitarian approach and limit meat intakes to several times per week rather than daily. Just remember that Rome wasn’t built in a day; your new eating plan will take time to “build” as well! Need more information about specific micronutrient deficiencies common in those following a vegetarian or vegan diet? About B12: If you are following a diet excluding all meats, eggs and dairy (vegan diet), you should take a B-12 vitamin daily. Fortified foods are not a reliable source of active B-12. Look for a sublingual (under the tongue) supplement at your local drugstore or talk with your doctor about monthly injections. About Iron: No need to worry about a iron deficiency, unless you are a woman of child-bearing age or elderly. If you are, ask your doctor about checking your iron level and appropriate supplements. About vitamin D: If you don’t consume food fortified with vitamin D, you will likely need a supplement. Vitamin D comes from dairy and fish and sunlight so if you avoid both, you may be in trouble. Look for orange juice and cereals labeled “fortified with vitamin D.” Too much vitamin D can be toxic. The recommendation is 600-800 IU’s daily. About Calcium: Vegans get calcium from leafy vegetables; tofu, tahini but nutrition experts recommend also including fortified foods such as ready-to-eat cereals and fortified rice or soy or juice beverages in the diet. About certain fatty acids (EPA & DHA): Flax, chia, canola oil or hemp are good sources of these fatty acids. Also include fortified foods including some soy milks and cereal bars. Pregnant and lactating women need additional fatty acids and should speak with their doctor about a supplement.